↑ Boards of Executive Directors - Member Countries. Web.worldbank.org. Retrieved on 29 July 2013. ↑ "About Us". World Bank. 14 October 2008. http://web.worldbank.org/WBSITE/EXTERNAL/EXTABOUTUS/0,,pagePK:50004410~piPK:36602~theSitePK:29708,00.html। আহৰণ কৰা হৈছে: 9 November 2008. ↑ Articles of Agreement: as amended effective 16 February 1989. ↑ "About Us". World Bank. 29 June 2011. http://web.worldbank.org/WBSITE/EXTERNAL/EXTABOUTUS/0,,contentMDK:20049563~pagePK:43912~menuPK:58863~piPK:36602,00.html#I1। আহৰণ কৰা হৈছে: 14 August 2011. ↑ "The Founding Fathers". International Monetary Fund. http://jolis.worldbankimflib.org/Bwf/60panel3.htm। আহৰণ কৰা হৈছে: 11 August 2012. ↑ 7.0 7.1 7.2 Goldman, Michael (2005). Imperial Nature: The World Bank and Struggles for Social Justice in the Age of Globalization. প্ৰকাশক New Haven, CT: Yale University Press. ISBN 978-0-30-011974-9. ↑ Bird, Kai (1992). 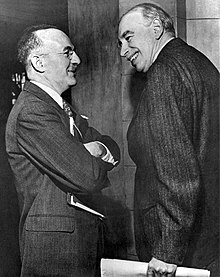 The Chairman: John J. McCloy, the Making of the American Establishment. প্ৰকাশক New York, NY: Simon & Schuster. ISBN 978-0-67-145415-9. ↑ World Bank. "World Bank Historical Chronology: 1970-1979". 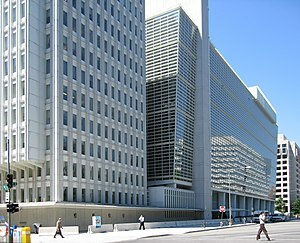 World Bank Group. http://go.worldbank.org/847R4CBE80। আহৰণ কৰা হৈছে: 31 May 2012. ↑ Office of the Press Secretary (23 March 2012). "President Obama Announces U.S. Nomination of Dr. Jim Yong Kim to Lead World Bank". The White House. http://www.whitehouse.gov/the-press-office/2012/03/23/president-obama-announces-us-nomination-dr-jim-yong-kim-lead-world-bank। আহৰণ কৰা হৈছে: 23 March 2012.